The culture of volunteerism is a proud legacy of the Filipinos as citizens and as a nation. Service is our way of life, as the practice of ‘bayanihan’ or mutual cooperation has long been instilled in our consciousness. It has played an important role in helping the nation with the recent crises and disasters. Undoubtedly, volunteers have enabled the country to rise above challenges and move forward. Volunteerism has become instrumental in improving the lives of the deprived and underprivileged. Thankfully, there are volunteers who willingly devote their time and effort to others and serve as essential partners of the nation in the quest of social change. The National Volunteer Month (NVM) is celebrated every December to pay tribute to the commitment and dedication of volunteers, regardless of class, age, gender, expertise, and interest, who are united by a common goal of achieving equality, peace, and development. Through NVM, the country recognizes the volunteers’ significance in nation-building. It honors the heroes who work without regard for material reward and find fulfillment in witnessing the change in the lives of people and communities they have touched. This year’s theme puts emphasis in the environment and highlights the volunteers who have poured efforts in taking care of nature in support of the Millennium Development Goals (MDG) on environmental sustainability. In celebration of this year’s National Volunteer Month, everyone is urged to be part of the campaign to protect, preserve, and sustain the environment through participating in national and local policy development and promotion, and supporting environmental campaigns. “In line with National Volunteer Month and also to support our advocacy being the premier environment-friendly building in Cagayan de Oro, this coming December 13, Saturday, 7 o’clock in the morning, Italpinas Euroasian Design and Eco-development Corp (ITPI) personnel together with Primavera Residences unit owners and tenants are enjoined to participate in a clean-up drive of Trade Street and surrounding areas within the Pueblo de Oro Business Park,” Jane Montebon-Duterte, PR & Marketing Manager, shared. 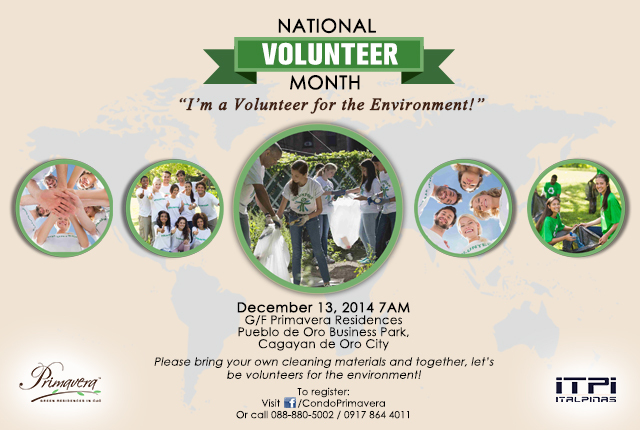 This coming Saturday, December 13, Primavera Residences invites you to take part in promoting a clean and green community. “We are continuously experiencing typhoons that are directly resulting from climate change and environmental degradation. The only way to protect the environment and move forward is to get everyone involved. Who are we to neglect and abandon the environment? We owe our lives to nature, who are we not to give back?” Cesar Stefan Rago, PR & Marketing Coordinator, said. Primavera Residences, which garnered several local and international recognitions for its commitment to green architecture and design, is known for its passive energy-saving features such as cantilevers that protect the units from direct sunlight and an indoor courtyard that maximizes the natural ventilation in the area. The building is also designed to withstand earthquakes and extreme weather conditions. “As a sustainable developer, Italpinas invites everyone to come and take part as we celebrate National Volunteer Month. Stand up and make a positive impact to our environment. Together, we can be catalysts for a better community. With commitment, we can make a difference.” Rago said. Sustainable developer ITPI, has invested in alternative locations where nature and the environment has been thoroughly preserved and optimized. Primavera Residences, located in a master planned community in uptown Cagayan de Oro, was built in 2009 and has been effectively on the lead in promoting green advocacies in Cagayan de Oro.